For one of the promotional events, Raashi wore stunning bell sleeves knee-length dress by Sahil Kochhar. 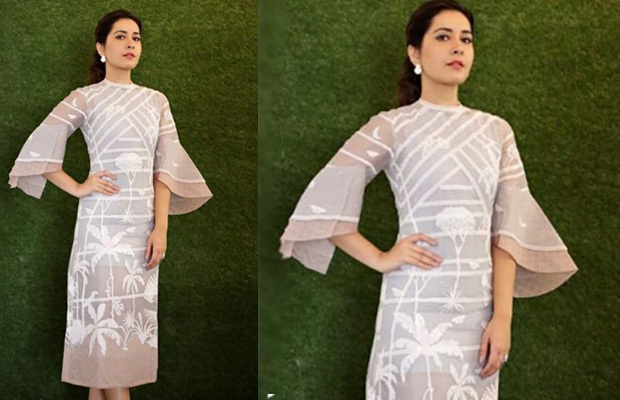 Raashi Khanna surely knows how to grab attention with her style statements. The actress has been making some eye-grabbing appearances at the promotions of her recently released film, Srinivasa Kalyanam. For one of the promotional events, Raashi wore stunning bell sleeves knee-length dress by Sahil Kochhar. Keeping it all classy, the actress finished out her look with earrings and metallic strap heels. Definitely not a ‘wow’ but we liked the way she carried the outfit with all grace and confidence. What do you think about this look? Yay or nay? Share your views in the comments section below. Talking about Srinivasa Kalyanam, the story of the film revolves around Vasu (Nithiin) who works as a designer in Chandigarh and is a believer in family traditions. He falls in love with a girl (Raashi Khanna), who is the daughter of a billionaire (Prakash Raj), who does not believe in family values. Srinivasa Kalyanam is all about the wedding and how things go across between the two different families. The film that has got a U certificate from the censor board with a runtime of 2.20 hours, is receiving mixed reviews from the audience on social media. Srinivasa Kalyanam has received mixed reviews and ratings from the audience. Srinivasa Kalyanam is being produced by Dil Raju and also stars veteran actor Prakash Raj in a pivotal role. The film will bring back the DIL trio – Nithiin, Prakash Raj and producer Raju. Interestingly, it was with DIL that producer Raju got the name Dil Raju since it was his first film as a producer.